A new method to separate hydrogen and oxygen atoms in water has been discovered by an Ohio inventor, John Kanzius. This video has been making the rounds but most who have seen it are skeptics. I think it's worth a look. Separating hydrogen and oxygen from water economically has been one of the holy grails of energy production for a long time. Such separation has long been achieved, but unfortunately not in an economical manner. Let's see how this new method does. How did John Kanzius stumble on his invention? Interestingly enough he was seeking to cure cancer. His idea was to use radio waves to heat certain metals like gold. Nano particles of gold would be injected into cancer patients and those particles are attracted to cancerous cells. Next radio waves would heat those particles and kill only the cancer cells. He did not discover a cure for cancer (not yet anway) but he did discover his radio frequency generator could burn saltwater. There are obvious implications such as powering turbines or engines now running on gasoline if his solution could work on a scalable basis. When asked what will he would do with profits from his invention, his reply was "keep looking for a cure for cancer". So far his method fails as the article Fire from Salt Water shows. John Kanzius has found a way to burn salt water with the same radio wave machine he is using to kill cancer cells. 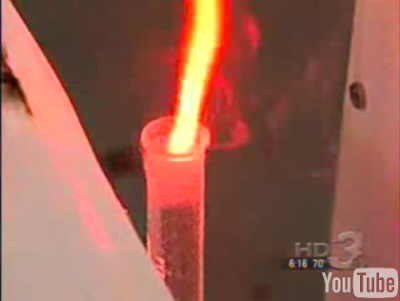 Kanzius was testing his external radio-wave generator to see if it could desalinate salt water, and the water ignited. While the phenomenon is interesting, it is not yet practical for energy generation. More energy is consumed by the radio frequency device than is produced for burning. Efficiency-wise, they are presently at around 76 percent of Faraday's theoretical limit. Devices such as the Hofmann voltameter have been used to produce hydrogen from water as the article Electrolysis of Water shows. The Hofmann voltameter is often used as a small-scale electrolytic cell. It consists of three joined upright cylinders. The inner cylinder is open at the top to allow the addition of water and the electrolyte. 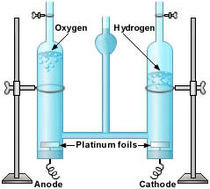 A platinum electrode is placed at the bottom of each of the two side cylinders, connected to the positive and negative terminals of a source of electricity. When current is run through the hofmann voltameter, gaseous oxygen forms at the anode and gaseous hydrogen at the cathode. Each gas displaces water and collects at the top of the two outer tubes, where it can be drawn off with a stopcock. Plants electrolyze water in the process of photosynthesis with very little energy required using a natural catalyst. If this method were developed industrially high levels chemical energy in the form of hydrogen could be produced at little cost and with absolutely no environmental damage. The old problem was generating electricity cheaply enough to make the process energy efficient. The new problem seems to be inability to produce radio waves cheaply enough to make the process practical for large scale applications. Can this possibly work in theory? There is a ton of internet articles out there claiming it is impossible. Do a search. You will find them. The one common theme in most of them is the idea that Kanzius claims to have invented a perpetual motion device. Burn water (or rather oxygen and hydrogen separated by his device) to achieve energy. What do you get when you burn oxygen and hydrogen? Water. Perpetual motion device? Not really. As I see it, he is using radio waves to heat up sodium ions hot enough to cause the hydrogen and oxygen in water to separate. Stop the radio waves and the process stops. That is far from perpetual motion. Can it possibly be that some magic frequency causes saltwater to turn into hydrogen and oxygen producing more energy than it took to generate the microwaves? I am not a physicist so I simply do not know. But I am convinced that this is both a new method and not a hoax. Proof that it is not a hoax are the patents given to the process. Here is a list of John Kanzius Patents. As best as I know, not a single patent has ever been erroneously given to the maker of a perpetual motion device. The good old formula E=MC2 tells us that there is more than enough energy in the universe for us to exploit. All we only have to invent are the technologies that can achieve efficient conversion. "Since it appears we now have now achieved more than unity, I am going to do an embargo on releasing all further information. "Actually there are smart individuals who have posted on different web sited and actually have a pretty good idea of what is happening." "I am in the process of redesigning the electronics for the saltwater as to see what efficiency we can achieve. "Why does everyone think this is a form of electrolysis? "Some scientists who have made comments on certain web sites actually understand the mechanism of action. Kanzius is not talking because his device is a hoax and has been disproved. Kanzius is not talking because he is on the verge of success if not achieved outright success. I cannot say if Kanzius has achieved practical application success or not but I am willing to say this is not an outright hoax. I am also willing to suggest that practical application could be theoretically possible. Any physicists out there can feel free to chime in. Running a car on saltwater may be impractical, but running turbines to generate electricity is potentially another matter(providing efficiency can be achieved). Regardless of practical application or not, we can all admire the spirit of John Kanzius. Everyone but the oil companies and oil exporters can wish him the best of luck at solving this problem.